Recovered from a broken parking meter in ████████. Special Containment Procedures: Instances of SCP-1779 are to be kept in Alpha Building at Bio-Site 66, in cages large enough to allow for comfortable movement. Each instance is to be provided with $8.00 USD weekly in assorted change. Wild instances are to be collected with traps baited with silver, with civilians aware of the entities provided Class-C amnestics. If a wild specimen has grown sufficiently large, they may be culled and returned to Bio-Site 66 for dissection and research. Breeding of additional instances of SCP-1779 is permitted with approval from the presiding Level 4 Senior Researcher. Breeding pairs are to be provided $30.00 USD in assorted change once eggs are discovered, including no fewer than sixteen (16, or $4) quarters, sixty (60, or $6) dimes, seventy-five (75, or $3.75) nickels and two hundred (200, or $2) pennies. SCP-1779 should not be provided precious metals outside of testing. Description: SCP-1779 is a species of cosmopolitan nocturnal reptile whose diet consists exclusively of metal currency. Instances of SCP-1779 are not predatory, and do not show interest in animals commonly preyed upon by reptiles of similar size, such as mice or insects. Specimens generally grow to an average length of .4 metres long and are scaleless, with feathery manes around their shoulders. This is largely dependent on diet, and much larger specimens have been successfully raised in containment. See addenda. It does not appear to matter which denomination said coins belong to; testing has shown that specimens of SCP-1779 will consume any of several dozen different varieties of currency with no appreciable difference in growth, and it is assumed that other varieties will be accepted if offered. However, while the denomination of coins does not seem to matter, the composition of the coins do; metals more susceptible to corrosion will generally lead to smaller specimens, and more robust metals larger. When nesting, SCP-1779 will gather coinage into large, bowl-shaped piles in secluded areas. Individual SCP-1779 have proven to be extremely territorial of their nests, loudly and violently attacking anything that attempts to steal a coin from their hoard. SCP-1779 flourish in cities where their primary food sources are available, nesting in crevices under the foundations of buildings or disused maintenance tunnels. Wild instances have been known to commandeer the nests of other animals such as rabbits or snakes, or take up residence in the walls or attics of rural homes. On average, a wild instance of SCP-1779 may reach up to 1 metre in length, but usually less. Biology: Biologically speaking, SCP-1779 are unique in that their skeletal systems will utilize metals extracted from common currency in the place of most other materials, forming different alloys depending on their diet. Only SCP-1779's skeleton is constructed of metal; the rest of the body is constructed of nonmetallic flesh. At this time, research has not provided a satisfactory explanation as to how SCP-1779's metabolism is capable of converting metals into organic material. Waste produced by SCP-1779 consists of dull metallic dust, which increases or reduces in frequency and amount depending on the individual's diet. If starved for an extended period of time, an individual SCP-1779 will begin to 'shrink', reducing in length and weight. A minimum length appears to be approximately .2 metres. While this unusual skeletal composition allows for unusually durable bones, it also prevents individual SCP-1779s from swimming effectively due to their relatively heavy weight. SCP-1779 have proven quite capable runners and burrowers, and certain instances have shown the ability to move at speeds up to 52 km/h (~32 miles/h) in short bursts. Additionally, SCP-1779 have proven to have extremely strong jaws, which are capable of slowly chewing coins into small pieces for digestion. Breeding: SCP-1779 are capable of breeding if they have a length of .4 metres or more. Breeding pairs will remain together until eggs are laid, at which point they will part ways. Breeding may take place at any time of the year, though the late spring is most common. The number of eggs laid vary depending on the size of the mother, but universally have a diameter of 3 cm. The incubation period is approximately 3 weeks, at which point the eggs will hatch and the young will scatter. SCP-1779 hatchlings are extremely flexible until an age of about two weeks, and are capable of squeezing through gaps of no less than 5 millimetres wide. The attached photo is of an individual, approximately 4-6 months old, which lived inside a parking meter until discovery. This individual 1779 presumably climbed inside the meter while a hatchling. Growth Patterns in Relation to Diet: As stated above, most contained instances of SCP-1779 remain around .3 to .5 metres long, and maintain this size through controlled feeding schedules. However, Dr Bridge has authorized testing on SCP-1779-08 to find how large SCP-1779 may grow, if given the opportunity. SCP-1779-08 was born in captivity, and matured to approximately 0.34 metres long with a weight of 18.5 kg under ordinary containment protocols. A high number of gold and silver coins were provided to SCP-1779-08 during testing, as well as assorted change provided as required to maintain the nest. All currency was minted at a Foundation-controlled establishment, and transported directly to Bio-Site 66. 03/01/2009: SCP-1779-08 moved to a solitary testing Chamber 3 in East Building. Immediately provided with $1200 in nickels, dimes, and quarters, to be maintained daily; also provided 10 silver dollars weekly. SCP-1779-08 soon observed sweeping all coins into a circular nest, placing the silver coins in a heap on one side. Over the next ten hours, SCP-1779-08 was also observed consuming the silver coins. Every three days, SCP-1779-08 was provided with 5 more silver dollars, which were promptly consumed upon delivery. 04/01/2009: SCP-1779-08 measured and weighed. Subject was observed to have grown to .8 metres long from snout to end of tail, with a weight of 31.3 kg. Research team ordered to continue the previously established diet. 06/01/2009: SCP-1779-08 measured and weighed. Subject observed to have grown to 1.2 metres long and 68.1 kg. Nesting materials increased to $1800 in assorted change, and 5 gold dollar coins (97.9% purity) begin to be provided every three days. 08/01/2009: SCP-1779-08 measured and weighed. Subject observed to have grown to 1.7 metres long with a weight of 97.6 kg. Research team ordered to continue the previously established diet. 10/01/2009: SCP-1779-08 measured and weighed. Subject observed to have grown to 2.6 metres long with a weight of 277.3 kg. Ration of precious metals ordered doubled, and nesting materials ordered increased to $3000 in assorted change. 12/01/2009: SCP-1779-08 measured and weighed. Subject observed to have grown to 3.4 metres long with a weight of 411.5 kg. 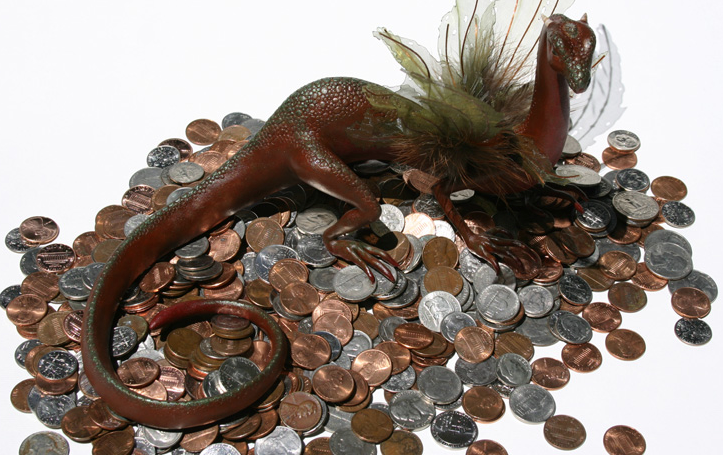 SCP-1779-08 observed to feed more often on non-precious coinage, and begins to hoard gold and silver coinage. Research team ordered to increase nesting rations to $5000. 02/01/2010: SCP-1779-08 measured and weighed. Subject observed to have grown to 4.6 metres long with a weight of 620.2 kg. Subject observed to pick out and consume nickels and quarters specifically, consuming only one or two precious metal coins a week. Research team ordered to cease providing pennies, but increase nesting rations to $7000 in assorted change, plus precious metals. 04/01/2010: SCP-1779-08 measured and weighed. Subject observed to have grown to 5.3 metres long with a weight of 775.8 kg. Subject's nest consists of approximately 50% precious-metal coins and 50% assorted other change; change carries an estimated worth of $8500. 06/01/2010: SCP-1779-08 measured and weighed. Subject observed to have grown to 7.7 metres long with a weight of 880.8 kg. Research team ordered to cut precious metal rations by 25%, but increase nest's worth to $10 000 in assorted change. 08/01/2010: During the bimonthly measurement process, SCP-1779-08 attacked and caused minor injuries to Research Assistant Clark. Measurement was successfully retried several hours later, after calming SCP-1779-08 with a sack of 25 silver dollars. Subject observed to have grown to 9.6 metres long with a weight of 1000.3 kg. SCP-1779-08's nest covers an area of approximately 45 m2. Researchers are ordered to maintain current weekly diet of precious coins. 10/01/2010: Over the previous two months, SCP-1779 was observed to go through a 'growth spurt', suddenly gaining a considerable amount of body mass. It was estimated to measure approximately 12.5 metres long and weigh approximately 1400 kg. It now will sweep its nest into a compact pile, curling its body around the hoard when asleep. When awake, it will repeatedly scatter and gather the hoard across the containment chamber for two to three hours in the early day, before calming itself and feeding. The reason for this behaviour is as of yet unknown. 12/01/2010: SCP-1779 reported to be unusually aggressive when researchers and D-Class personnel entered its chamber for measurement. For this reason, Dr Bridge has deemed it unnecessary to manually measure and weigh SCP-1779-08 at this point. SCP-1779-08's nest is estimated to have a worth of approximately $12 000 in change, and $3.5 million, possibly more, in gold and silver. Currently, SCP-1779-08 has a length of [INSUFFICIENT CLEARANCE] and a weight of [INSUFFICIENT CLEARANCE]. Nesting rations are no longer being provided; at this time, SCP-1779-08 appears contented to remain inside Chamber 3 in East Building, and further containment procedures are not required. Personnel are to access Chamber 3 only when absolutely required. Controlled use of SCP-588 is currently being investigated as a means of termination should SCP-1779-08 attempt to breach containment.